Eli Nahom, of New Milford, finishes first in the CIAC Boys Cross Country State Open Championship at Wickham Park in Manchester with a time of 15:54 on Nov. 1. 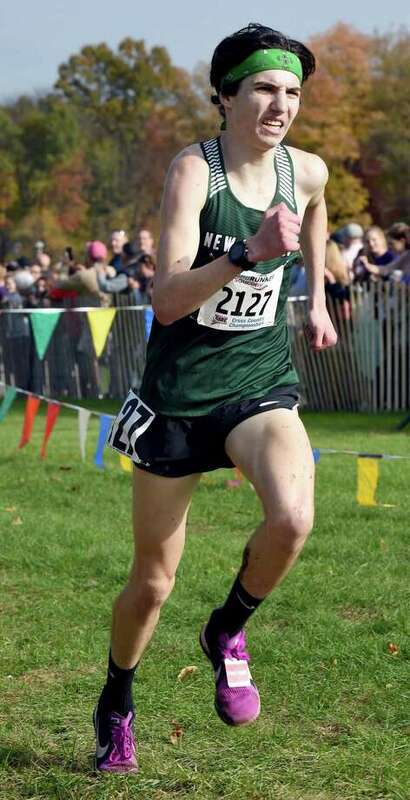 Mission accomplished for New Milford cross country standout Eli Nahom. After capturing his third straight Class L title a week earlier, the senior went out and ran his way to one of the few titles that has eluded him during his stellar career, a State Open title. Nahom won his first State Open title last Thursday at Wickham Park, finishing with a time of 15 minutes 54 seconds. He was the only runner in the field to break 16 minutes and he finally broke through at the Open. Nahom’s time was a second faster than what he ran to win his third Class L title this season. He finished fifth at the Open last year and made his move toward the Open title with a move up Wickham’s green monster, going against his pre-race plan. After his spurt to pull ahead Nahom emerged from the woods with a comfortable lead. He finished 10 seconds ahead of Conard freshman Gavin Sherry (16:04). Nahom’s time also established a new school record on the course, besting the one he set just a week earlier. Now established as the best cross country runner in the state, Nahom can turn his sights toward showing how he stacks up against the best in the region. Nahom will run in the New England Championship meet in Manchester, New Hampshire at Deeryfield Park on Saturday. “He should be in the top pack again at Derryfield and, if he can get a good read of the hilly course, we like his chances,” Bacich said.